Everyone recognizes traditional Hassidim - they stand out in their traditional garb and adherence to the ways of their forefathers in Eastern Europe. The wide-brimmed hats and long black coats of the men and the modest dress and wigs of the women invite curiosity, for Hassidim seem like a novelty. The Hassidic community derives from adherents of an 18th century leader, the Ba'al Shem Tov, who taught that the best way to do God's will was to pray with concentration and devotion, and live one's life with joy and religious sincerity. This ideology ran counter to the prevalent view of the time that the ultimate goal of a Jew should be scholarship. The Ba'al Shem Tov, had followers who ignited the Hassidic movement in Eastern Europe. Each town had its own leader, it's "Rebbe" and the names of each Hassidic community were derived from the name of the town where their Rebbe was located. Upon each Rebbe's death, the leadership was taken on by a descendent....a son, son-in-law, nephew, grandson, etc. The Hassidim of the town of Breslev in the Ukraine revered their Rebbe, Rebbe Nachman, as an exceptional holy man. He was a mystic and wanderer who loved nature, and encouraged his followers to pray and meditate in the fields and forests as a way of drawing closer to God, a process that he called "hitboddidut" (seclusion). He wrote songs and poetry which expressed his connections with God and the land, and is remembered for inspiring his followers to always be joyful and never give in to despair. Upon Rebbe Nachman's death, his Hassidim did not name a successor, and until today, when Breslev Hassidim speak of their Rebbe, they are speaking of Rebbe Nachman. Aside from this anomaly, until recently, the Breslev Hassidim were a Hassidic group much like any other. They dressed in distinctive Hassidic garb and followed the tenets of Hassidic philosophy. Tzfat is a major of center of Breslev Hassidism in Israel, both the "old" Breslevers and the "new ones". This distinction between "old" and "new" Breslevers has developed in recent decades when Breslev Hassidim started to become outreach oriented and to bring young secular Jews towards religious observance. These young newcomers latched onto a wing of Breslev philosophy that has encouraged them to publicly dance and sing the songs and tunes of Rebbe Nachman as a way of drawing people towards traditional Judaism. In addition, they believe that increasing joy through song and exuberant expressions of happiness is what Rebbe Nachman taught, and that this will hasten the coming of the Messiah. 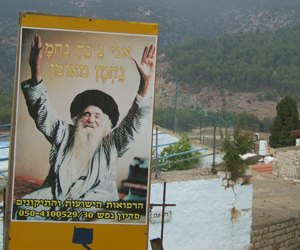 These public displays are seen frequently on the streets of Tzfat, especially during the peak tourist season, when groups of Breslevers, wearing their distinctive white skullcaps with tassels and singing their mantra, "Na Nach Nachman M'Uman" ("Nachman of Uman") sing, chant and dancing exuberantly. Guides have been known to time their visits to Tzfat to coincide with these "celebrations". If anything can give a visitor to Tzfat an understanding of Tzfat's unique character, these Breslev performances will do the trick.